Kennedy was particularly alarmed by his trigger-happy Air Force chief, cigar-chomping General Curtis LeMay, who firmly believed the U.S. should unleash a pre-emptive nuclear broadside against Russia while America still enjoyed massive arms superiority. Throughout the 13-day Cuban missile crisis, Kennedy was under relentless pressure from LeMay and nearly his entire national-security circle to "fry" Cuba, in the Air Force chief's memorable language. But J.F.K., whose only key support in the increasingly tense Cabinet Room meetings came from his brother Bobby and Defense Secretary Robert McNamara, kept searching for a nonmilitary solution. When Kennedy, assiduously working the back channels to the Kremlin, finally succeeded in cutting a deal with Khrushchev, the world survived "the most dangerous moment in human history," in Schlesinger's words. But no one at the time knew just how dangerous. Years later, attending the 40th anniversary of the crisis at a conference in Havana, Schlesinger, Sorensen and McNamara were stunned to learn that if U.S. forces had attacked Cuba, Russian commanders on the island were authorized to respond with tactical and strategic nuclear missiles. The Joint Chiefs had assured Kennedy during the crisis that "no nuclear warheads were in Cuba at the time," Sorensen grimly noted. "They were wrong." If Kennedy had bowed to his military advisers' pressure, a vast swath of the urban U.S. within missile range of the Soviet installations in Cuba could have been reduced to radioactive rubble. Vietnam was another growing source of tension within the Kennedy Administration. Once again, Washington hard-liners pushed for an escalation of the war, seeking the full-scale military confrontation with the communist enemy that J.F.K. had denied them in Cuba and other cold war battlegrounds. But Kennedy's troop commitment topped out at only 16,000 servicemen. And, as he confided to trusted advisers like McNamara and White House aide O'Donnell, he intended to withdraw completely from Vietnam after he was safely re-elected in 1964. "So we had better make damned sure that I am re-elected," he told O'Donnell. Fearing a backlash from his generals and the rightunder the feisty leadership of Barry Goldwater, his likely opponent in the upcoming presidential raceKennedy never made his Vietnam plans public. 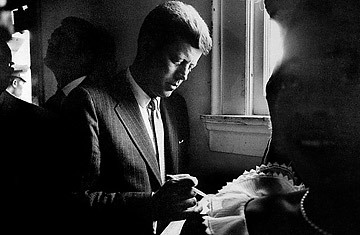 And, in true Kennedy fashion, his statements on the Southeast Asian conflict were a blur of ambiguity. Surrounded by national-security advisers bent on escalation and trying to prevent a public split within his Administration, Kennedy operated on "multiple levels of deception" in his Vietnam decision making, in the words of historian Gareth Porter. Kennedy never made it to the 1964 election, and since he left behind such a vaporous paper trail, the man who succeeded him, Lyndon Johnson, was able to portray his own deeper Vietnam intervention as a logical progression of J.F.K. 's policies. But McNamara knows the truth. The man who helped L.B.J. widen the war into a colossal tragedy knows Kennedy would have done no such thing. And McNamara acknowledges this, though it highlights his own blame. In the end, McNamara says today, Kennedy would have withdrawn, realizing "that it was South Vietnam's war and the people there had to win it... We couldn't win the war for them."